Brushing and flossing your braces properly is important for your oral hygiene — but you are probably wondering what’s the best way to do that? Let’s begin with your basic brushing tools: Either a soft-bristle brush or a bi-level brush (one that has shorter bristles in the middle and longer bristles at the edges) can be effective. Used carefully, your electric toothbrush can work just as well. But be sure your electric brush is set to a moderate power level, and don’t let its vibrations cause the back of the brush to hit your brackets or braces! In addition to regular brushing with fluoride toothpaste for at least two minutes, you may encounter trouble cleaning the areas near brackets and wires, there are some special tools that may help. One is the interdental toothbrush, or proxabrush. It has a small tuft of bristles that stick up all around, like a pipe cleaner. Use it gently and carefully to clean the tiny spaces under your wires and around your bands and brackets. Flossing is extremely important to maintaining a healthy smile with braces. To keep your teeth and gums clean and healthy, you need to floss at least once per day. But how do you get floss under the archwire of your braces? It’s not so hard with the help of a floss threader. 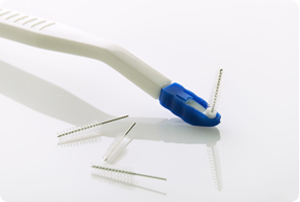 Using this device is somewhat like threading a needle: You pull one end of floss through the threader, and then push the threader — carrying with it the free end of the floss — under the archwire. Now grasp the floss on each end and slide it up and down the sides of both teeth, and all the way under the gums until you hear a squeaky sound. Finally, pull it out and use a new section of floss for the next area. One major advantage of Invisalign is that your trays can be removed for easy cleaning. So, please don’t neglect to do this! You’ll need to brush your teeth after every meal or snack so that food and plaque do not get trapped in the aligners, which could promote tooth decay and gum disease. Your clear aligners will also have to be cleaned regularly; caring for you aligners is very simple. You can do this by brushing them and then rinsing them with lukewarm water. Also, please keep in mind that while wearing Invisalign is very different from wearing braces, the importance of retaining your post-treatment results is exactly the same.